KaBOOM! releasing report this weekend | KaBOOM! KaBOOM! is attending the National League of Cities Youth, Education, and Families (NLC – YEF) biennial summit in Boston, Mass. this weekend. Mayors, council members, senor municipal staff, and school and community partners will come together to discuss cutting-edge city innovations and strategies for helping families cope with the economic crisis. During the conference, KaBOOM! 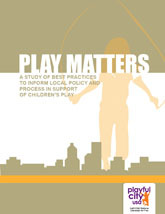 will officially release “Play Matters,” featuring 12 best practices in play from across the country. The purpose of "Play Matters" is to describe successful local initiatives to improve opportunities for play and draw conclusions about why they have worked. The impact of these initiatives is gauged on three dimensions: increasing the quantity of available play spaces and play opportunities, improving the quality of spaces and experiences and increasing children's safe access to play. This report also identifies emerging data linking play initiatives to positive outcomes in health, education, the environment and the economy. In conjunction with the national release of “Play Matters,” Mayor Baker of St. Petersburg, Fla. will discuss one of the city’s signature programs, “Play ‘N’ Close to Home.” This program creates a playground within a half mile of every child in the city and is featured in “Play Matters.” Mayor Baker will present during the “Healthy Communities and the Built Environment” session of the conference Oct. 12. For more information about “Play Matters” and Play ‘N’ Close to Home visit /bestpractices.